OROKLINI Large & Spacious Ground Floor Apartment. Sleeps up to 6 from €325 p/w. Polly's Beach Villa in Ayia Thekla is less than 100m from a small cove where you can enjoy the Mediterranean Sea. This villa has quality furnishings throughout and the accommodation comprises lounge with leather sofas and TV/DVD, large spacious kitchen which is fully equipped with all appliances, separate dining room which also caters for extra guests sleeping in a double sofa-bed. A downstairs shower room with toilet is also to be found on the ground floor. Upstairs you will find one large king-size bedroom with amazing views of the Mediterranean Sea and access to a large balcony. The second bedroom is a twin bedroom, also with access to a balcony with views of the sea. Family bathroom with basin sinks and quality accessories. Outside there is a large swimming pool, BBQ area with outside dining furniture. Less than 100m away is the Mediterranean Sea and a small, sandy cove. If you are interested in renting property 1052, please fill in and submit this form and we will contact you shortly, or please use our contact form if you also want to send us a message, quoting Ref 1052. 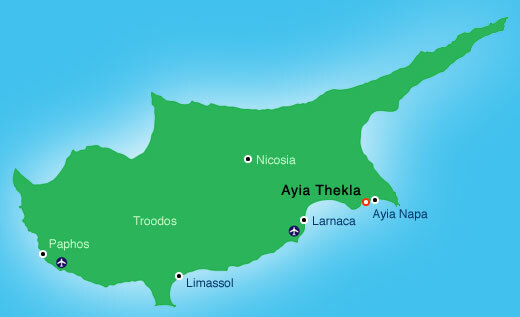 Situated 6km west of Ayia Napa is petite Ayia Thekla. It has a small island nearby and is within walking distance of the main road that takes you to Ayia Napa. Ayia Thekla takes its name from a tiny old church in that area bearing the same name. The coast of Ayia Napa is considered as the finest for beaches in Cyprus. Extensive silvery, sandy beaches cover the area. Along the beaches are facilities for all sea sports including water skiing, wind surfing, sailing canoes, pedals, motor boats, scooters, speed boats, parachutes, scuba diving and more.